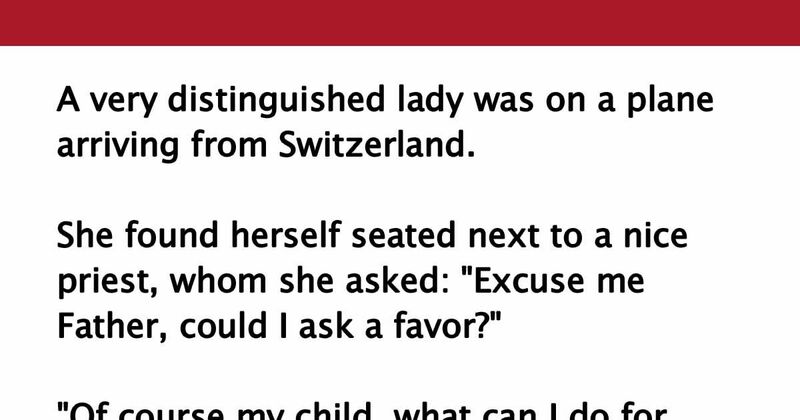 She found herself seated next to a nice priest, whom she asked: "Excuse me Father, could I ask a favor?" "Here is the problem: I bought myself a new sophisticated body hair removal gadget for which I paid an enormous sum of money. I have really gone over the declaration limits and I am worried that they will confiscate it at customs. Do you think you could hide it under your cassock?" "Of course I could, my child, but you must realize that I can not lie," the priest responded, frowning. "You have such an honest face, Father, I am sure they will not ask you any questions," she said, and she gave him the tool. The aircraft arrived at its destination. When the priest presented himself to customs, he was asked, "Father, do you have anything to declare?" The priest replied, "I have there a marvelous little instrument designed for use by women, but which has never been used." Breaking out in laughter, the customs officer said, "Go ahead, Father. Next!" Nicely done! SHARE this funny story with your friends on Facebook!